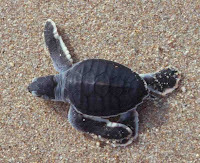 We're getting reports of sea turtle hatchling sightings. This little guy is a green sea turtle hatchling. Our friend and colleague Jim Angy took this photo. Jim has been photo-documenting sea turtles (and the rest of the beach critter inhabitants) for years. You'll see lots of his photos in our Florida Beach Basics - The Space Coast DVD and the accompanying reference cards. If you happen upon anything turtle-related, please feel free to leave us a comment to a post. The Sea Turtle Lighting extravaganza in Cocoa Beach last Saturday was very educational, and a good chance to catch up with like-minded sea turtle lovers. If you need more information about the proper lighting for sea turtle protection, leave a comment and we'll send you resource names and links. The passing of Hurricane Bertha gifted local surfers with some good waves, and they were out in force Saturday. Matt and I stopped at a Patrick Air Force Base on the way home to see if the many-ribbed hydromedusas had made it that far south, but there were none to be found, although Margie tells us that they were still invading Cocoa Beach. Great waves at Patrick, although rip current warnings were also being issued for the County. Check out the Reference Section of our website http://www.floridabeachbasics.com/ for more information on rip currents. I'll post pix when Matt gets them to me. The local newspaper reports that the Tour de Turtles sea turtle naming contest is down to three choices after several hundred entries. Options are Amelia Seahart, Belle o' Brevard or Shellsea. I think the best name I heard was Paddlin' Madelaine, but that did not make the list.